How to use the dblp search? Which technology does dblp use for searching? Which technology does dblp use for searching the website? e.g., sig matches "SIGIR" as well as "signal"
e.g., graph$ matches "graph", but not "graphics"
Update May 7, 2017: Please note that we had to disable the phrase search operator (.) and the boolean not operator (-) due to technical problems. For the time being, phrase search queries will yield regular prefix search result, and search terms preceded by a minus will be interpreted as regular (positive) search terms. The full-text search results are provided via , courtesy of AI2. 2018-11-06: We are celebrating 25 years of dblp! The dblp computer science bibliography is celebrating its 25th anniversary. On this occasion we would like to invite you to our celebration colloquium. Since more than a year now, dblp has intensified its efforts to link dblp bibliographies to ORCIDs used by that author. ORCID information are now added regularly to the dblp data set. The primary sources for ORCIDs are: first, the annual ORCID open data dump and, second, metadata directly provided by publishers who have started to increasingly label author signatures with ORCID information. Neither of those data sources are free of errors and data hick-ups, so we are still manually cleaning the ORCID data prior to adding them to the corpus. But overall, ORCIDs have helped us to correct numerous cases of homonymous and synonymous bibliographies in dblp, so it is absolutely worth our time. The oldest publication with an ORCID is from 1961. Because of the small number of publications in dblp from that time, the ORCID coverage for 1961 is a remarkable 0.12%. 2018-04-09: Historical dblp file is now available. A historical version of dblp (called hdblp) is now available at zenodo. hdblp contains historical revisions of all metadata records in dblp. The file can be used to reconstruct dblp for each day between June 1999 and March 2018. Finally, all dblp servers now support HTTPS. We will gradually move towards exclusively using HTTPS in the future, so please feel free to update your bookmarks. We are happy to celebrate more than 4,000,000 million computer science publications in the dblp computer science bibliography! ORCID (http://orcid.org) is a widely used persistent identifier scheme for researchers. As of September 2017, there are more than 3.8 million registered ORCIDs of which about 800,000 have at least one publication listed in the public ORCID corpus. Many publishers will now ask their authors to provide an ORCID when submitting or publishing a paper. We encourage all researchers to register and map their ORCID with their publications. 600 cases where an author profile was related to more than one ORCID. 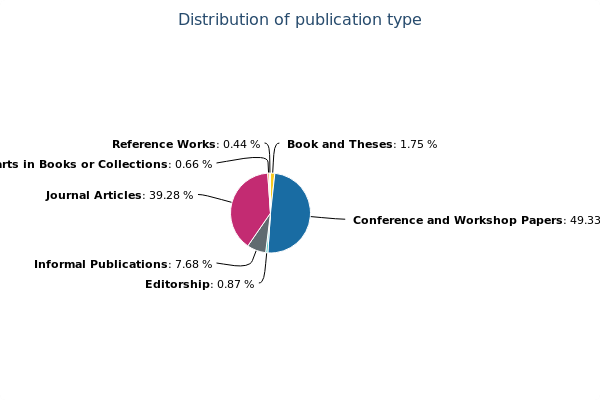 This indicates that the profile actually lists publications from different authors. 5000 cases where the same ORCID appears in more than one author profile. We are currently processing these cases. While we found several cases where ORCID information is wrong (e.g., authors accidentally claiming publications that where written by someone else), the data is very reliable in general. However, according to our philosophy, manual confirmation is needed. This will take some time. A detailed description on ORCIDs on the dblp web interface and in the data dump can be found at in our F.A.Q.s. We will keep you posted on development. This service provides open bibliographic information on major computer science journals and proceedings. dblp is maintained by Schloss Dagstuhl, dblp has been originally founded at the University of Trier in 1993. For more information check out our F.A.Q. You may download the raw dblp data in a single XML file. A simple DTD is available. The paper DBLP - Some Lessons Learned documents technical details of this XML file. In the appendix DBLP XML Requests you may find the description of a primitive dblp query API. The data is released under the ODC-BY 1.0 license.